Italpresse Gauss is now part of Norican Group - a world leading provider of technology for the formation and enhancement of metallic parts. 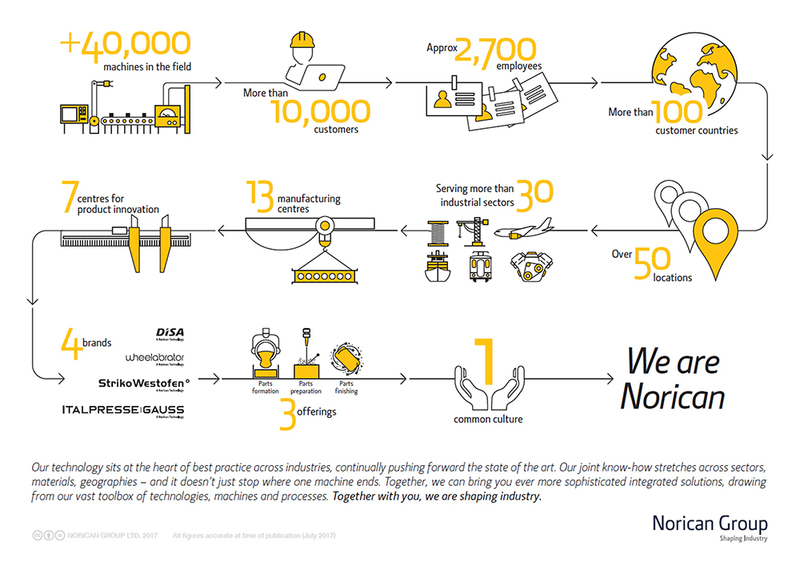 From melting, dosing and moulding through to surface preparation, Norican Group provides the solutions to solve your challenges. Joining Norican Group means we can be even closer to you and offer you more. Our joint know-how stretches across sectors, materials, geographies – and it doesn’t just stop where one machine ends. Together, we can bring you ever more sophisticated integrated solutions, drawing from our vast toolbox of technologies, machines and processes. You can expect even more innovations, a broader product offering and an expanded service network. From September, we will be sending you Norican News via email to bring you the best stories from across the entire group. You can expect a rich stream of informative and entertaining content that helps you stay ahead of the game. Add info@e-noricangroup.com to your safe sender list so you don’t miss out. Norican Group is now made up of big names with great heritage. Our new infographic shows what that means in numbers – a bigger network, more locations, a more complete offering.